I was working my shift, and with it being the busiest day before Christmas, many shoppers were at Sears buying their last minute gifts. At around 4:15, my co-worker’s shift ended and I was alone until the next associate came at 6:00. Luckily I survived among grabbing shoes and ringing up countless amounts of sales. At 5:45, the busy rush stopped and I had just enough time to put away all the rejected items and organize the shelves. At around 6:15, I took my 15-minute break, then upon coming back, I arrived right on time to handle another small line of 4 customers. Then, about 10 minutes later, while organizing the woman’s boots, I had a customer approach me and ask about how to convert her shoe size on abercrombie.com. I know it’s totally irrelevant to my job, but I was willing to help. She had her i-phone out and was showing me these letters “m” “p” and “l” on the numerical values which ranged from 5 to 24. Some numbers did not show up, which is presumed that the website was sold out of. After gazing at the screen for about 10 seconds, I saw a green-cheeked conure on her arm. I was so surprised at seeing that. I didn’t say anything yet, but I suddenly lost my train of thought. I blurted out “let me think, ummm” and other lost-thought type of words. Then I said to the woman, “You have a nice bird there”. She replied, “Thanks, some people feel sort of afraid. I bring him with me because it gives me comfort. I just feel happy with him with me”. I think she is very dedicated to show love and compassion for such amazing creatures. I never got the conure’s name because I forgot to ask. While I was walking with the woman through the store to compare sizes of jeans, I tried to guess what kind of bird she had. I couldn’t figure it out, but then I said “it’s a quaker parrot, no, wait”, then the woman said, “look at the heart on its back.” I then said “it’s a lovebird”, but wouldn’t you know I was wrong anyways. I thought it would be obvious, but not in this case. I feel stupid to realize it was actually a conure, since I used to watch videos of birds dancing to songs on YouTube, most of which were conures. I looked at the long tail, and thought to myself, “oh, that actually makes sense.” She told me that this bird is very smart. “Yes”, I told her. “I did a lot of research on birds, so I have always liked to learn about them. I want to get a pet raven one of these days”. I picked a raven for a different reason, and although their intellegence is part of the reason, there is a more important reason which I’m not ready to mention. It does have something to do with videos I’ve done in the past, just to give you a hint. I am always interested in how intelligent birds actually are. Did you know that most birds have the intelligence of a 4-year old child? It’s true! I learned that on a tv infomercial from Bird Paradise, which does do their own tv show on WMCN, channel 44. 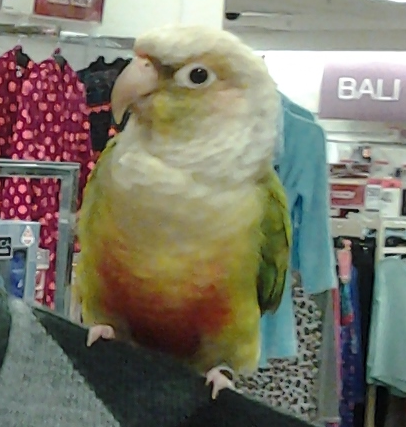 After speaking to her about her size and doing the conversions, I tried to pet her conure, but it pecked at me before I could reach its head. I knew this conure took me as a complete stranger, and was afraid I may harm it, which is why it defended itself. That conure didn’t peck hard. As a matter of fact, not even larger birds such as macaws can cause pain from their beak, mostly due to the fact that they swallow their food whole instead of chewing it. 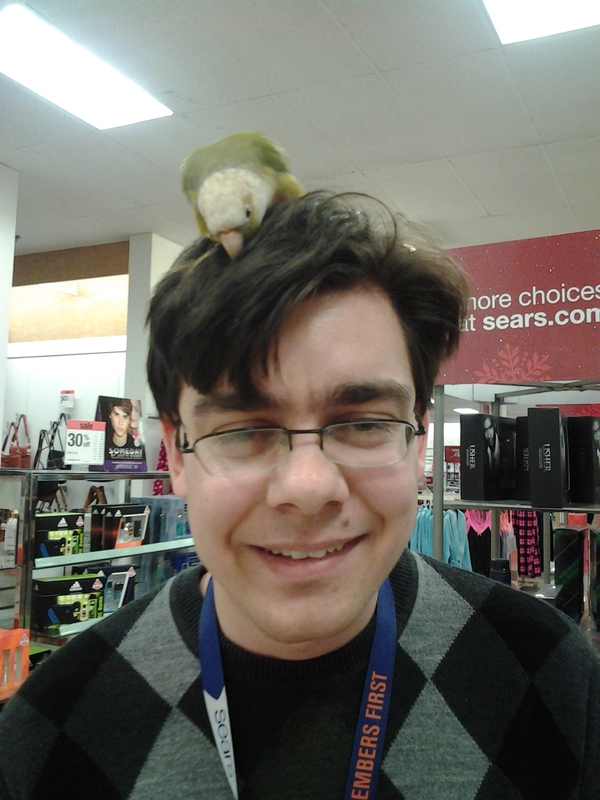 I saw a man walk into Sears once with a macaw, and I didn’t experience any pain when it pecked at me. That’s why they got gizzards inside their body instead of teeth. The defensive strategy is also used to protect itself from being handled by anyone EXCEPT for its true mate, which is the owner. Most birds only have one mate, and they mate for life by the way. I learned it is better if I end up getting my own pet bird, that I buy a young bird rather than adopting an older one, since one or many owners have owned it. Once I said my good-byes, and she recommended that I take a picture of her bird after saying “It’s a shame I have to leave so soon”. I never really thought of having pictures of her conure, but because this is something I may never experience again, I should have a memory of it somehow. I had 8 pictures taken of this woman’s conure taking many different poses on my arm and on my head. I had this great experience that gave me hope in such a busy day at work. The last words the woman said was “Make sure you enjoy dinner with your family.” Wouldn’t you know I went over to my mom’s house and had some salad and pasta with my brothers. I also decided to spend some time watching my other brother play “Watch Dogs” on the PS3 before I went back home. Well, to conclude what I experienced, take every moment in, because it’s the only way to make them last. Here’s an awesome picture I recorded of this conure on my head. It seems like it was getting used to me, although I’m just an object to it when I’m just standing there. My YouTube username is jeremytheplayer88 if you want to see some videos of me rescuing a baby starling. Take care! ← Someone is 1-starring my blogs!